La Mesa is a city in Southern California located just east of Downtown San Diego, dubbed with the civic motto “Jewel of the Hills.” Here’s our guide to the top 10 restaurants in the city. Antica Trattoria is a charming and authentic Italian restaurant featuring the best of Tuscan cuisine in La Mesa. With Italian inspired murals and décor, and a tasteful display of wines and warm colors, you will feel welcomed into an escape of good food and hospitality. Chef and owner Francesco Basile is always in house preparing his award-winning homemade Italian recipes, like lasagna baked with meat sauce, béchamel, and mozzarella cheese or linguine with mussels, clams, calamari, and shrimp with herbs in a light shrimp stock and tomato sauce. When you walk into Antica Trattoria, be prepared to step into an authentic Italian experience. With a warm and lively atmosphere, richly flavored dishes, and fine Italian wines, Antica Trattoria will leave you with a pleasant taste of Italy. Himalayan Cuisine is a doorway to the old world of traditional Nepalese and Indian cooking. The flavorful tikka masalas are a favorite amongst frequent visitors, along with many other dishes full of exotic spices. Explore authentic Indian tastes of ginger, garlic, turmeric, saffron, and curries while enjoying a relaxed atmosphere of southern Asia. No matter what you order, a serving of freshly baked naan bread, lentil soup, and rice is always included. Looking for a unique and delicious dining experience, but wary of strange spices” Your server will ask you your desired level of spice. Just next door, there is also a Himalayan marketplace to buy dry goods, spices, groceries, clothing, and other items reminiscent of an old world market, without the haggling and bartering. At Himalayan Cuisine, you will feel immersed in a culture of warmth and hospitality. Brigantine Seafood Restaurant has long stood as a reliable establishment for quality seafood and a unique atmosphere with its rustic nautical décor. Enjoy traditional seafood entrées like pan-seared salmon, shrimp and grits, or crab cakes or try something a little different like Brigantine’s Thai seafood stew—a mix of shrimp, mussels, white fish, lobster tail, coconut milk, julienned vegetables & flavorful red curry shellfish broth. With a positive Zagat rating all around, Brigantine’s food, décor, and service cannot be beat for the cost of dining. The restaurant is also known for its San Diego style surf and turf, award-winning fish tacos, freshly shucked oysters, and classic filet mignon. The food is always fresh and flavorful, but if you are looking for something on the lighter side stop in during happy hour for their custom cocktails and home town craft beers. First opened in 1969 by the Morton family, the Brig embodies the beach town lifestyle of community, flavorful food, and friendly service—popular with visitors and locals alike. Casa De Pico is an internationally renowned Mexican restaurant known for its award-winning cuisine and unbeatable cultural atmosphere. Its wandering mariachis and world-famous Birdbath Margaritas make Casa De Pico the perfect place for any fiesta, be it a romantic evening or night out with family and friends. Walking through the front door of this cantina, you are guaranteed a cultural immersion of everything Mexico. Whether you are eating in the dining room filled with vivid colors, hand-painted authentic folk art, and wrought iron chandeliers or on the patio with its great fountain, tropical plants, and colorful flowers, you will feel the festive spirit of Mexico thriving around you. Unlimited chips and salsa keep coming while you wait for your entrées. 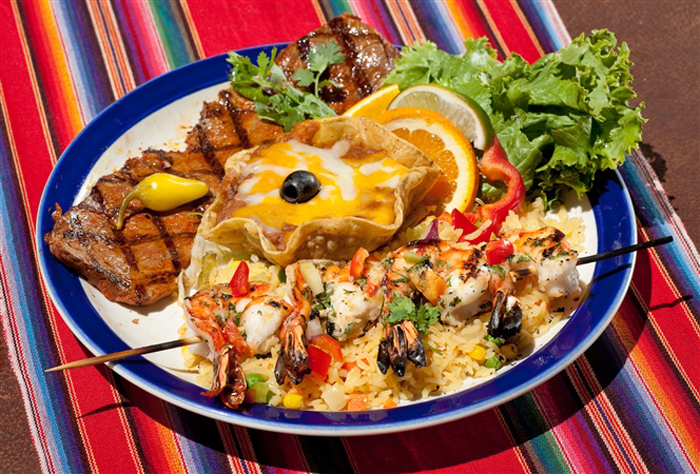 Enjoy anything from tequila lime shrimp to a grilled chicken and mango quesadilla. More traditional favorites include enchiladas, fajitas, and carnitas, and be sure not miss the handmade warm off-the-griddle tortillas. With everything it has to offer in food, service, and atmosphere, Casa De Pico is as close as you can get to an authentic Mexican dining experience without crossing the border. Anthony’s Fish Grotto, established in 1946, is a San Diego landmark restaurant, is consistently voted one of San Diego’s best seafood restaurants, with positive Zagat ratings and some of the freshest fish and seafood around. Enjoy delicious lobster, fresh seasonal catches, salads, pastas, famous clam chowders, and crispy fish and chips in a more casual atmosphere with friendly home-style service. You might want to try the Maine lobster trio with choices of grilled salmon, shrimp, fried shrimp, coconut shrimp, or crab bites, or maybe one of the pasta primavera with a choice of shrimp, chicken, salmon, or vegetarian. With large windows and a view of the San Diego Bay, you can enjoy a beautiful lake view and feel the ocean breeze. Described as a hidden gem by locals, Anthony’s Fish Grotto will provide you with a more casual dining experience with a quality fresh selection of seafood. BJ’s Restaurant & Brewhouse is a casual hangout spot with a great selection of food and drink. Hunker down on an autumn night with a seasonal pumpkin ale float and savory soup in a bread bowl, or enjoy anything else on the extensive menu from a classic rib-eye dish to New Orleans jambalaya. BJ’s Restaurant is a family friendly establishment with a varied mix-and-match meal selection for kids, while adults enjoy a wider range of shareable appetizers, lunch specials, handcrafted burgers and beers, specialty salads, pizza, pasta, steaks, and other entrées like lemon thyme chicken or cherry chipotle glazed salmon, all generously portioned and expertly prepared. Don’t miss dessert with one of BJ’s famous Pizookies—a hot out of the oven cookie with ice cream made to order. Choose from salted caramel, peanut butter s’mores, cookies’n’cream, or try a sampler of three mini Pizookies during your visit. If you are looking for variety and a comfortable casual atmosphere, BJ’s is a good choice for your night out with family or friends. Rubio’s is a top choice in La Mesa for quick quality Mexican food, offering a spread of anything from grilled steak and guacamole burritos to a California bowl full of fresh ingredients like citrus rice, black beans, romaine lettuce, salsa fresca, and your choice of pan-seared shrimp, tilapia, mahi mahi, or grilled chicken. A traditional quesadilla or lobster enchilada might also have your mouth watering, but the real treat at Rubio’s is the taco Tuesday special. Enjoy any mix of seafood tacos for only $1.50 each on Tuesdays after 2:30pm. With positive Zagat ratings, Rubio’s is a favorite stop for lunch or a quick snack in a casual setting with friendly service. Serving sustainable seafood when possible, Rubio’s also keeps a standard of making conscious choices for keeping current customers and future generations healthy. With inventive recipes, fresh ingredients, and conscientious cooking, Rubio’s is a top pick for those hoping to grab a quick, healthy, and most importantly, flavorful bite to eat. Swami’s Cafe is a family owned restaurant with an extensive menu for both breakfast and lunch. With friendly and efficient service, Swami’s has customers order their fill and pay at the counter on arrival. Customers are then given a number to place at the table until the food is brought out freshly prepared. Swami’s offers large portions and good prices for every meal—omelets, waffles, pancakes, eggs any way, salads, sandwiches, wraps, and other standard favorites like quesadillas, burritos, and stir fry. The food is always fresh and the ambiance of the place has a beachy feel with vibrant murals and tropical décor. Smoothies, fresh squeezed juices, and a large selection of self-serve coffees and teas are also on the menu at Swami’s. Enjoy anything from a tropical shrimp wrap with walnuts, dried cranberries, organic greens, avocado, and balsamic vinaigrette to a simple BLT with avocado. For a casual breakfast or lunch with a large selection of food, Swami’s is a great place to get a meal well worth your dollar. Bamboo Fresh Thai Cuisine is yet another family owned restaurant that cannot be beat when it comes to authentic Thai food. Reasonably priced with large portions, Bamboo Fresh offers a menu of anything from pad Thai and classic Thai curries to more innovative and exciting creations. Something like avocado curry might seem strange and unheard of, yet customers find it just as delicious as the more traditional dishes. The décor of Bamboo Fresh is simple but well-done and creates a quiet, clean, and relaxed atmosphere. Service has been rated exceptional by reviewers, who consistently vouch for the restaurant’s friendly and attentive staff. If you have room for dessert, the tapioca coconut milk and mango sticky rice are two popular selections on the menu, always a satisfactory end to the meal. For all Thai food enthusiasts out there, Bamboo Fresh Thai Cuisine will not disappoint. BO-Beau Kitchen & Garden is a unique restaurant with a casual laid-back atmosphere and diverse menu. Appetizers include anything from a meat and cheese board to bruschetta or escargot, and dinner options include dishes like a roasted fresh catch, slow roasted pork shank, the burger royale, linguini and clams, and many more. If you are looking for something on the lighter side, BO-Beau also offers a large selection of soups and salads, starters, and flatbreads. The environment is described on BO-Beau’s website as “Bohemian-chic meets Industrial elegance” with options of dining inside, at the bar, or on the outdoor patio. While the restaurant does have a lively atmosphere, it is never too loud to disturb conversation. BO-beau fits all occasions, whether you are meeting friends on the patio for drinks and appetizers, celebrating a special event with family, watching a game at the bar, or spending a romantic evening with your significant other.